If there is one thing I hate in PHP world then that’s PEAR. With full respect to it, but it simply does not work for me. I usually jump around from Linux, Windows, OSX on a monthly basis and honestly I have never had it work out of the box. There where always some installation issues with PEAR itself then with the packages. Experience I’m describing here is completely subjective so please do not look at it as me trashing the PEAR. If it works for you, then great. If not, then here is s little HowTo on installing the PHPUnit manually without PEAR. Using the above list, you pull those packages into the appropriate folder on your disk, I usually create the /lib folder and then add it to my PHP include_path path. Here is how the structure of my folders looks like. if "%PHPBIN%" == "" set PHPBIN="C:\WampDeveloper\Components\Php\php.exe"
Now add the “C:\Users\branko\Server\lib\PHPUnit” to system path variable, so that “phpunit” command on console executes the “C:\Users\branko\Server\lib\PHPUnit\phpunit.bat”. You also need to have add php.exe to system path. Save the above code under test1.php then run the console command “phpunit test1.php” (given that you are in the folder where test1.php is). If you see the message “Your test successfully failed!” then you got everything setup OK. I wish there was a software to test installation instructions – because none of them works. Firstly I’ve got to say thank you for posting this! Lord knows how many people needed this! I know this post is a little old but though I’d add a comment with some useful information to it. I also donwloadet PHPunit (only 403 KB so i am wonderering). 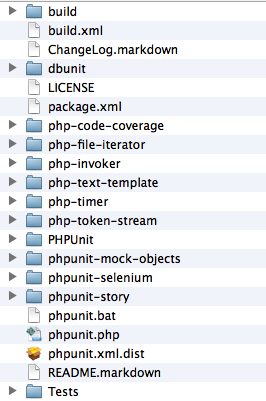 There is no phpunit.bat into. have you taken a look at composer? and how to install this sucker?